It has been eons since I’ve written anything here on my blog, and for that I apologize. It’s not because I haven’t thought of you, my fabulous readers/followers, because believe me, I have…often. The reason my blog has been silent for so long is because my life has been so packed with running, racing, and coaching—my other passions–that something had to give. That something…which I can barely admit here because it’s truly unthinkable…is…reading. Considering how much I love to read, it’s not something I ever imagined I’d let happen. But being in constant motion over this past year, I could never keep my eyes open long enough to get to the bottom of a page, or stay focused long enough to swim in the magic of words on a Sunday afternoon. And here’s the thing: without reading, there is no writing. At least no creative writing. When you are not enveloped in the beauty of language and pulled where your senses are awash in imagination, writing takes on a different quality. Oh sure, you can still knock out little blips here and there, and if you’re lucky, you might even be able to eke out a gem or two, but to fully tap into your inner-writing amazing-ness, you’ve got to read. Fortunately, after far too long, I’ve finally crossed back into the literary world, thanks to a morning run up the street with my dog. 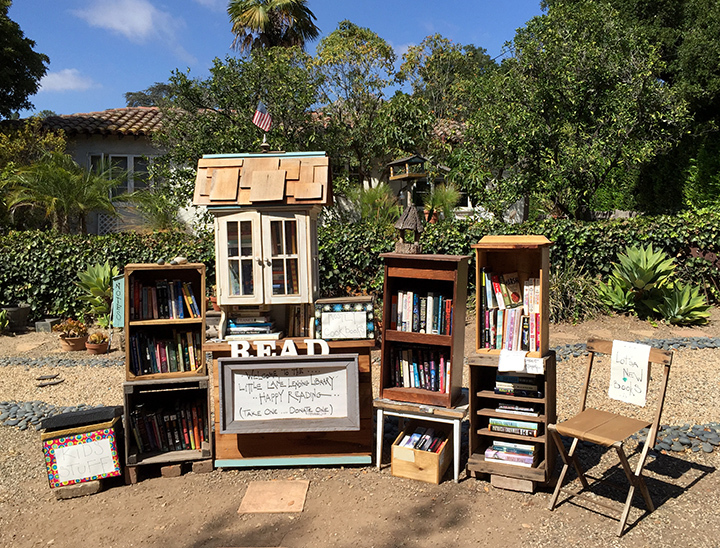 Our sweet neighbors set up a little neighborhood lending library in front of their house (yes, I live in Mayberry, thank you very much). 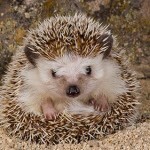 On a whim I grabbed The Elegance of the Hedgehog by Muriel Barbery. The writing is so fine, I lingered over words and sentences longer than my morning cup of coffee (if you know me, you know how long that can be). We’re talking goosebump producing prose, and characters that make you continually contemplate the over-arching beauty and complexity of the world around us. After reading this book, I feel like I can breathe again, like my right arm has been reattached, and I’m suddenly back to where I cannot ‘not write.’ It’s the same feeling I had when I knocked out over a dozen chapters of my book in progress, The Art of an Improbable Life, while at the same time writing magazine articles, blog posts and three-quarters of a novel—one whose ending still bumps around in my head. Who knew that reading could have such a profound affect on one’s writing? Well, of course we all know how important reading is, but until you’ve survived a literary drought, you will never fully understand the depths of its importance. Now that I’ve finished Barbery’s masterpiece, my mind is gleefully spinning, trying to decide which book to linger over next. I’m searching for one just as compelling as the last so I don’t let old habits creep back in and let other responsibilities become more important than my precious reading time. Do you have any book recommendations for me? I’d love to hear from you! 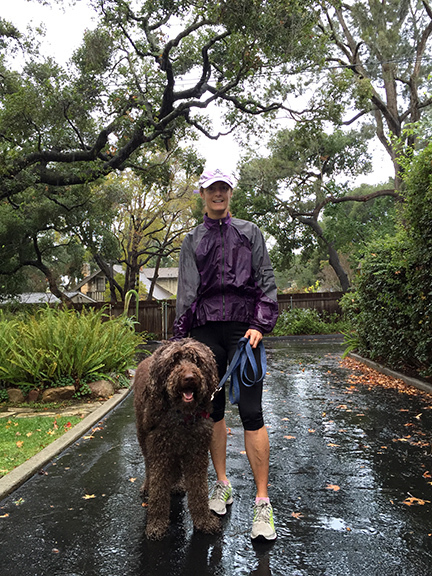 PS: In the meantime, I thought I’d share a picture of my big brown running partner, Doodles. This was taken on a rare rainy day here in CA. He doesn’t go far, but somehow he always manages to take me where I need to be–like the lending library up the street. 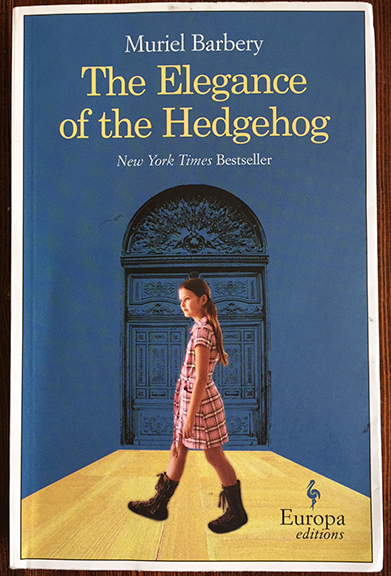 This entry was posted in Creativity, Writing and tagged blogging, creative writing, lending libraries, Mureil Barbery, neighborhood lending libraries, reading, The Elegance of the Hedgehog, writing by Becky Green Aaronson. Bookmark the permalink. Welcome back, Becky! I was just discussing the irony of an online writer’s life with another prolific writer, that it it leaves little time for reading. 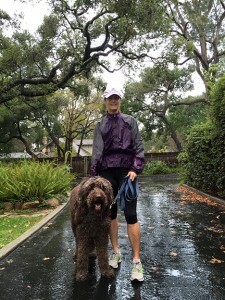 Like you, I’ve taken a hiatus and come back with one resolution for 2015 — to read more. My favorite recent fiction: The Signature of All Things by Elizabeth Gilbert. I’m currently reading The Art of Slow Writing by Louise DeSalvo. Highly recommended. Looking forward to hearing more about your book-in-progress! i so enjoyed that book as well, Becky! I’m so happy to hear you’re getting back into writing again. I’ve missed you! You wear so many hats and you’re so good at so many things that I’m surprised you can ever get anything done. I’m looking forward to reading you again and I’m hoping you’ll inspire me to post more often! So good to have you back. Trying to write without reading is like a musician who never listens to music. 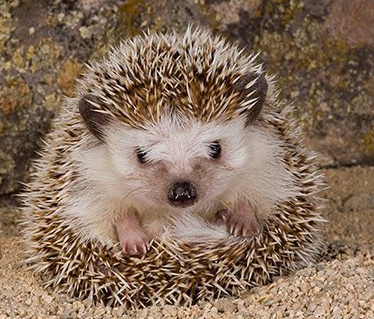 I loved “Hedgehog” and would agree on all of Britton’s picks, especially “Truth About A Marriage” and “The Gin Closet.” I’m buried in memoir and personal essays right now for a class I’m taking. I think we’re all due for another gathering, don’t you? Hugs! Thanks for the book recommendations and the warm welcome back. And YES, we are due for another gathering! Oh hello….and oh how glorious it is to read you again. I do so love the way you craft words on a page. Meanwhile, I have had a similar revival of my reading. For years, as my marriage dwindled, I could not concentrate on words adequately enough. I read, but by starting and not finishing book after book after book. Finally, as life settled down and, ugh–I know it sounds absurd–I found the love of my life, and every single thing, including my reading, clicked into place. Recently, after finishing my novel, I began to read in earnest, finishing book after book after book, including “The Gin Closet” by Leslie Jamison; “The Story of a Marriage,” by Sean Greer (as well as his most recent work); a couple of books by Ann Patchett (“This is The Story of a Happy Marriage,” and “The Getaway Car”); as well as “Olive Kittredge,” and a few more I am forgetting. I would recommend all of the above. You are so right on about writing and reading going hand in hand–and I have especially found that if you are trying to craft beautiful words, replete with seamless metaphors and imagery, you must read those who have mastered it. If you are trying to craft a plot-driven novel, it helps to read books with a plot so engrossing you cannot put the book down (versus the savoring one does with a literary gem). My most recent blog post, Exoskeleton, surprised me when it surfaced; its feel the direct result of the influence of the language I had savored in two of the books above: Elizabeth Strout’s, and Sean Greer’s. I look forward to hearing more about what you decide to read! Welcome back friend. Britton, you always have a way of putting things into perspective, and that perspective is always warm and unfiltered, which I love. If I ever get to the point where I’m unable to read again, a giant red flag will shoot up, reminding me that my life is way out of balance. Love your list, too. I’m adding all these to my “Books to read” list, which I’m buzzing over like an over-caffeinated bee. Oh dear, did I just write that? Clearly I need to read some more! Thanks for the list. I’ve heard of the authors but never read them — looking forward to some entertaining evenings with these suggestions. Yes, Yes, Yes. I was so bogged down over the holidays I told myself NO BOOKS until things are caught up. Then I committed to reading and reviewing 10 works for an online group by March! OMG. What will I do? And if that doesn’t fill up your days, you can always try my new book out in March (Postcards from Wonderland). Thank you Rona! What a terrific list! Even though I’ve heard of all these gems, I’ve only read a few. So many books to look forward to again! And, I just started Yellow Crocus this morning. Congrats on your upcoming book release! I will be sure to check it out. There’s absolutely no writing without reading . . . and I especially love that time between writing projects when I luxuriate in reading — kind of shifting the balance between putting out and taking in. 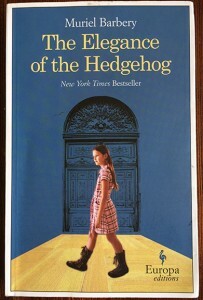 I read ‘The Elegance of the Hedgehog’ several years ago and was thoroughly charmed, moved, and impressed. To think — it took a dog to bring you back Seriously, your post is also a reminder that it isn’t only the time spent writing that makes us writers. The book sounds amazing. I look forward to reading it. I’m almost finished reading Elizabeth Strout’s “Olive Kitteridge” which I highly recommend for her brilliant story-telling and skillful wordplay. Nice to hear from you!! I loved this book and hope you’ll tell me what you think if you read it. I read Olive Kitteridge a few years ago and enjoyed it a lot. I’ll have to look through my bookshelf to see if I still have it. Thanks for reminding me about it!